Commercial surrogacy is now against the law. Indian women can no longer be rented as breeders and exploited like cattle for the wealthy. Children can no longer be made-to-order commodities for purchase on the international market. This alone is cause for celebration. International surrogacy is prohibited and must be brought to an abrupt halt. Under the new law, only Indian citizens may avail themselves of surrogacy in the country. The number of women who may be used as surrogates is vastly curtailed. The law mandates that only close relatives of intended parents may act as surrogates. Only people with medically diagnosed infertility can use a surrogate to obtain a child. This will preclude both gay men and fertile heterosexuals from using surrogates to have children, further shrinking the pool of exploited women and purchased children. Benefiting Indian women’s health and well-being, a woman may only serve as a surrogate once in her lifetime. This is a great advance against the industrial factory farming of women. In a victory for children’s human rights, under no circumstances can intended parents abandon the child. No buyer’s remorse allowed should intended parents change their minds for whatever reason. Further respecting children’s human rights, children cannot be created for the purpose of being a commodity for sexual or labor exploitation or any other nefarious intention. In order to prevent fraudulent arrangements among parties procuring a child, only couples who have been married for at least 5 years are eligible for surrogacy. While the law allows surrogacy, it limits the practice to “altruistic” surrogacy meaning no payment of any kind is permitted, further buttressed by restricting surrogates to close relatives of the intended parents. The infertile couples legally allowed to participate in surrogacy cannot have any other living children except if the child has mental or physical disabilities or has a life-threatening illness. Finally, there are age restrictions for the intended parents though the upper ends are problematic. For women, they must be between the ages of 23 through 50 and for men, ages 26 through 55. Many people become grandparents in their 50s, so to have a newborn at 50 or 55 is unfair to both parents and children. People in their 50s are aging and women are post-menopausal. Babies and children require an enormous amount of energy and physical stamina that people in their 20s, 30s and even 40s possess, but not those in their 50s and beyond. An infant provided to parents at 50 or 55 means they will be 70 and 75 when the child turns 20; there are evolutionary reasons why reproductive years have limits. By far the biggest problem associated with the new law is its lack of enforcement provision. The government has enacted no mechanism to police the new law. In a country as large and populous as India, how can these positive elements of the legislation be implemented and monitored? A related and equally problematic aspect of the surrogacy law is that there is no budget created to carry it out. 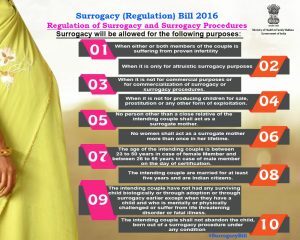 The only monies provided by the government will be to conduct the meetings of the National Surrogacy Board and associated State Boards. Without funding to carry out implementation and enforce the law’s provisions, it is nothing more than words on paper. Since no criminal penalties are attached to the law, those who break it enjoy impunity. A real danger exists that women will be coerced by their families to act as a surrogate for siblings or other relatives who are infertile. India has a long and notorious history of dowry deaths or “bride burnings” along with sati or widows thrown on their husbands’ funeral pyre. What will become of the innumerable surrogacy factories located throughout the vast country of India? Infamous surrogate profiteer Nina Patel has long planned her under construction industrial one-stop-shopping surrogacy conveyer belt. What will become of that? Can the government force construction to stop and prevent it from ever operating? What about the black market in surrogacy that operates in India? As documented on the US television show “Vice,” a reporter went underground and was offered a live baby; one of the discarded infants created through surrogacy. How will the government shut down these trafficking operations? In conclusion, India’s new law represents a major step forward given its recent history as the surrogacy capital of the world. The crucial bottom line however is that without enforcement mechanisms and a budget to carry out the law, it could become a chimera for the women and children of India.